There is nothing as devastating and life changing as loosing a child. There are two different griefs from loosing a child, both crushing and overwhelming. There is the loss of a child when there was nothing you could do, and there is a very different more complex pain when you yourself are responsible for the loss of your child, through abortion. I wish people would realize this and comfort both. Both are suffering immensely. No one can go back and undo something we've done. We have all made mistakes in our lives. We have all sinned and need a Savior to wash away our sins and heal the brokenness inside us. We all need comfort and healing. God loves us all and feels our pain. He cares for every heartache and offers to bear our burdens. There is help. There is hope. I have another post that has links to information about all the different kinds of abortions and how to be healed from the suffering and guilt many are overwhelmed with afterward. You can click here or follow the link for "abortion" in the label cloud. One more immense comfort: According to God's Word (the Bible), all who are born in flesh are born with the sinful nature of humanity and if we live long enough, we are all going to sin and be lost eternally, but your baby never had a chance to sin. Your baby died in a saved condition before reaching the age we are held accountable for sin - they are safe in the loving arms of their Creator and our Father in Heaven! They are where we are striving to be. Though this is a terrible way for it to happen, we need never worry about their eternal destination. We need never worry if they will give their lives to Christ or reject Him. They are safe now for eternity and if we repent and give our lives to Jesus, asking Him to save us, are immersed in water baptism and live faithfully until death, we will one day meet our precious children in that place where there will be no tears, no sorrow, no sickness and no death. Your Lord does not want you to live in guilt once you have done this. Guilt is only a tool to convict us of sin so we will come to Him and be saved. After we've done this, any guilt we feel is from the devil and is contrary to the Word of God. We need to refuse it and choose to believe God's Word - all of it! You are forgiven! God bless you. If I can help in any way, please e-mail me. 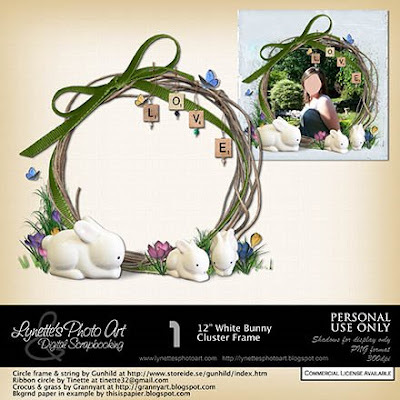 Today I'm giving you this sweet White Bunny Cluster Frame made with the White Bunnies I'll give you tomorrow and some gifts from other designers. If you like the effect I used on the photo, I just added a layer mask and painted on it with several brushes to partially remove the photo where it extended beyond the frame. 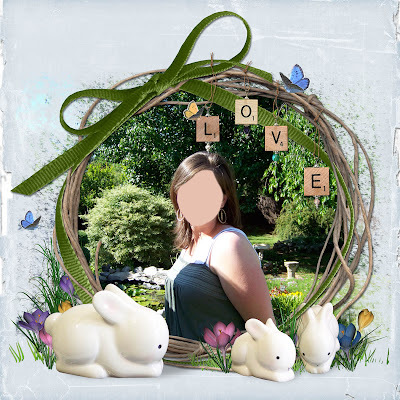 Credits: Circle frame & string by Gunhild at http://www.storeide.se/gunhild/index.htm; Ribbon circle by Tinette at tinette32@gmail.com; Crocus & grass by Grannyart at http://grannyart.blogspot.com; Bkgrnd paper in example by thisispapier.blogspot.com. Thanks for your generosity Ladies and God bless you! THANK YOU THANK YOU Thank you! for this cute bunny cluster! 06 kwiecien 2009 [ hour 5:00pm EU].Thanks again. Thank you so much for this Freebie. I want to let you know that I posted a link to your blog in Creative Busy Hands Scrapbook Freebies Search List, under the Easter post on Apr. 06, 2009. Thanks again. All your work is so wonderful. Thank-u so much. Thank you for the adorable wreath and bunnies. Have a Blessed Resurrection day. Thank you so much for these darling bunnies and the beautiful frame. Your generosity is very much appreciated. What you say about the new way of rearing children is so true...sometimes I think the parents are just looking to have someone else "raise" their kids, so it's more convenient to put them in all these activities rather than giving up some of their own time to be with their children. Someday when these precious kids are all grown, their parents will be sorry to have missed their childhood. Thanks so much for this frame, and happy Easter!